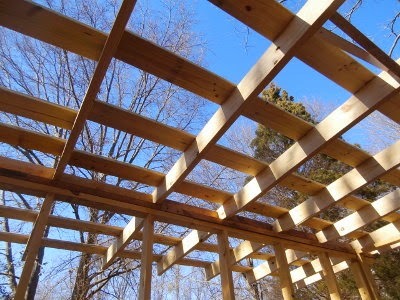 I have more progress on the chicken coop to show, the roof. Since we have more projects than money, we discussed all options. We made lists of materials and crunched the numbers. In the end, the cheapest turned out to be a corrugated metal roof. 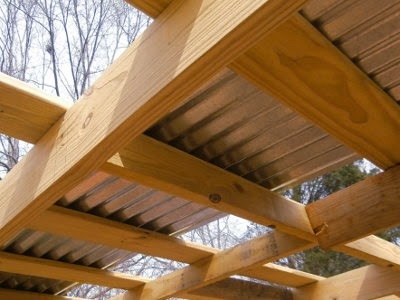 Besides price, metal is the best surface for rainwater collection. The drip edges come in 12 foot sections. We needed 24 feet 3 inches! Dan bought a small piece of flashing to fill in that gap rather than a whole 'nother section. He finished right about dinner time and then it began to rain. We got almost an inch and a half and there were no leaks. Yay! Next step, walls. This is going to be one fancy coop. Do it once and do it well. Dan has a lot to be proud of (including his wife). Looking good. I have the same problem with materials. Now I always try to build things "modular" so that it works with standard sized materials., like 8' for ply wood or multiples of 16' for timber, it can save a lot of waste building this way. Are you going to set up a rainwater collection system from this roof to provide water for the chickens? The great joy of your photographs is the clarity they provide. I see the blocking but the second picture shows boards laid straight on top. How are those attached? Is the corrugated strong enough for Dan to be on top nailing or does he do it from a ladder? What kind of nails does he use? I used the ones with the rubber gaskets and over time, they just rotted. I need a hay barn, so I am asking a lot of questions! Lynda, when you say fancy I think of all the suburban chicken coops I see advertised, complete with a little picket fence! :) As long as this one protects the chickens and meets our needs, I'll be happy. Kev, you'd think we would have learned that by now, LOL. I've definitely been making mental changes in regards to the next building project - the goat shed. You're right that it's so much easier to build according to material availability. Fern, yes! Possibly for water in one of the nearby forage areas too, depending on amounts. Dan's (mentally) working on the system including a filter. I'll post about it all the way! it's amazing how much water one roof collects! we're not finished yet, but we put 6 l buckets under the gutters of the new sheds. just a small drizzle shower fills a bucket in no time (and a real shower lets them overflow within seconds:). once we've installed the big 1000 l tanks - we can take a drought anytime (not that we have all that many over here on the green isle:). the one downside of corrugated metal and plastic - raindrops (never mind hail!) make an awful racket on the roof! Now that's what I call a nice looking chicken coop. The perfect height too. You don't have to squat to get inside for picking up eggs or cleaning. Progress is something we all like to see in our little (or not so little) projects. So well done, you two. Glad to hear you're going to capture the water, as it really helps between storms. Gosh that's going to be a nice coop! The metal roof and water collection is a really good idea. What an impressive coop. You've given me some inspiration for my next coop, we want more chooker moles so they need a bigger palace. Barb, Dan said the nailers are 1x6 (can use 1x4s) they are nailed to the rafters this particular photo is somewhat confusing. You're looking at the "porch" overhang, which was pieced together with odds and ends. You can see it in the previous post photo #8. The panels are screwed in (1" metal roofing screws with rubber washers). Dan didn't actually stand on the metal but on the nailers. He suggests patching with silicone caulk or roofing tar. The book he recommends is Carpentry and Building Construction by John Feirer and Gilbert Hutchins. His was published in 1976 ( a used book sale find). Newer editions are available and pretty cheap on eBay. I hope all that helps! Bettina, we're amazed at the same thing! Dam laments not having enough tanks, totes, and storage containers to catch and store it all. Sandy, thanks! The best part is that it will have plenty of space to store cans of chicken scratch and feed! Chris, funny but last year we never needed it because we had an unusually rainy summer. Dan would still like more tanks, and use the rainwater for toilet flushing too. I have just finished reading your book, excellent read and of great interest as we are on our way to moving to our own 5 acres although we live in the UK. Mama Pea, I somehow missed your comment when I responded earlier. I like the sound of rain on a metal roof too, but the others are right, it can get thunderous! Dawn, thank you so much! I appreciate your taking time to drop by and let me know. My goal was to encourage others and I hope it does that as you begin your own homesteading journey!